Become Kris Kringle with this Deluxe Standard Size Santa Suit Costume. 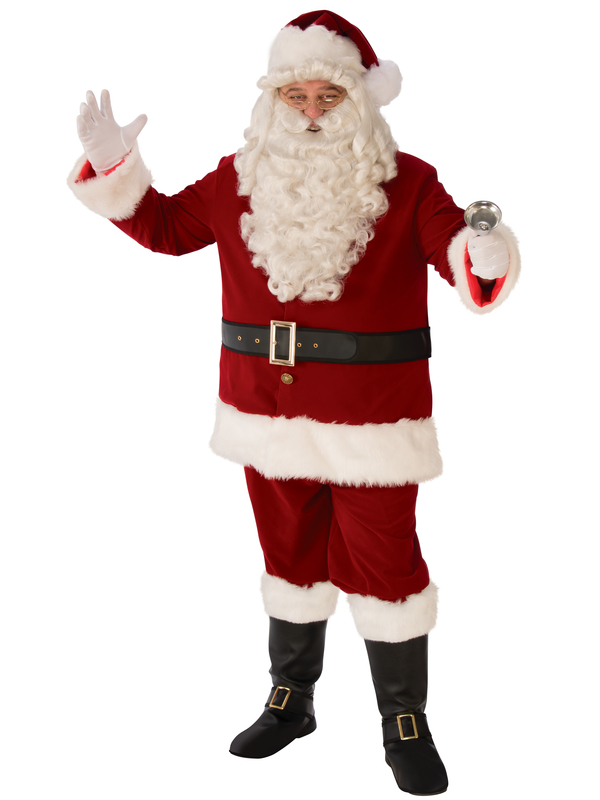 This men's outfit recreates the classic appearance of this famous holiday mascot. Also known as Father Christmas, this jolly character works to deliver toys and games to good girls and boys all over the world. He is miraculously able to do this in one night. This is all possible thanks to the dedicated efforts of his crack team of reindeer and his tireless throng of elves. Every December 24th, kids stay up all night in hopes of hearing a faint 'ho ho ho' on the wind. Now you can wear this classic style of this famous figure with this deluxe costume set. This collection features a red coat with white fur-trimmed details. Additionally, this outfit also includes matching pants, a large buckle belt, white gloves, a red pom pom hat, black boot covers, a white wig and a matching beard. You'll have everything you need to become the big guy from up North with this all-inclusive set.